Programmable thermostats are highly touted, and deservedly so. But you won’t automatically save energy and save money simply because you have one installed. Savvy homeowners will learn all the ins and outs of their programmable thermostats, develop strategies for using them, and make sensible adjustments based on the information their thermostats provide. Various thermostats have different capabilities, and you should study your options carefully to make sure you select one with the right package of features. Some thermostats let you program each day individually, while others have separate settings for weekends and weekdays, or one unitary setting to cover the whole week. Presumably, you’ll save more money and more energy if you can program each day of the week individually, based on your personal habits, but if you have a consistent schedule that may not be necessary. Newer, so-called “smart” programmable thermostats can decode your home comfort habits and program the operation of your HVAC system automatically in response (with override options available, of course). This could be ideal if your activities and home comfort preferences are stable and predictable, or if you worry that you’ll forget to program your thermostat on your own. Smart thermostats with WiFi connectivity give you 24-hour control of your home environment, regardless of where you are in the world. All you need to do is install the appropriate thermostat app in your smartphone or tablet, and once you learn to use it you’ll be all set to go. WiFi capability will add to the expense of your thermostat, but if you are a detail-oriented person you’ll likely gain maximum energy efficiency from having a unit that gives you minute-by-minute control over the functioning of your heating and cooling system. This is perfect if you have an unpredictable schedule and are often uncertain about when exactly you’ll be arriving home. Theoretically, a programmable thermostat with WiFi capability offers peak energy and money savings, but that is only true if you are prepared to exploit the WiFi feature for everything it’s worth. Some smart programmable thermostats directly monitor the activity of furnaces, air conditioners and heat pumps, and they can give you warnings if there is a decline in performance or any other sign that suggests maintenance or repairs are needed. 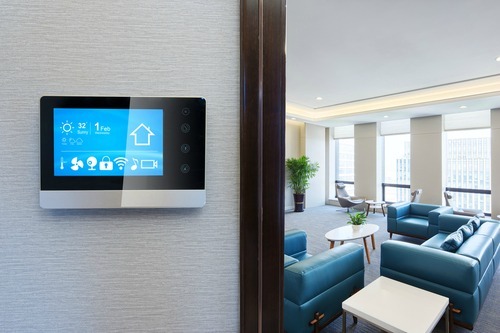 In addition to connecting with home heating and cooling equipment, many smart thermostats can also be connected to humidifiers or dehumidifiers, allowing you to customize their operations as well. Before purchasing any programmable thermostat, you should familiarize yourself with all its capabilities to see if it offers any extra benefits you might find attractive (and profitable). Most programmable thermostats come with factory settings, but you must take control of them yourself if you expect to gain maximum benefits. In summer or winter, set your thermostat 7-10 degrees higher than you normally would for at least 8 hours a day. According to the U.S. Department of Energy, you’ll save 10 percent on total energy costs by following this advice. Program your thermostat to keep the home at least 10 degrees warmer or cooler than normal while you sleep. When programming the thermostat for the overnight hours, set it so it will begin reducing or raising temperatures one hour before you to bed, and set it to begin reversing the process 30 minutes before you are scheduled to awake in the morning. For the best combination of money savings and acceptable comfort, the Department of Energy recommends setting your thermostat at 78 degrees during waking hours in summer and at 68 degrees during waking hours in winter. Naturally, your comfort preferences may vary. Temperatures should be kept 10-15 degrees higher or lower than normal when you are away from home. To make sure this doesn’t compromise your comfort, program the thermostat to activate your HVAC system 20-30 minutes before you leave the home, and/or 20-30 minutes before you arrive. Of course, if you have a programmable thermostat with WiFi connectivity you can make the latter adjustments from wherever you are. Many people are intimidated by what they perceive to be the complexity of programmable thermostats. But if you take the time to read the user’s manual and experiment with its different features, you’ll soon figure it out. Your HVAC contractor is a valuable resource as well, and you shouldn’t hesitate to ask them questions about how to use—and get the most out of—your new programmable thermostat. In Colorado and Wyoming, Rheem Pro Partner is the unsurpassed expert in home comfort technology. Please contact us today to learn more about programmable thermostats, and about your affordable options for purchase and installation.